Welcome to another edition of Adventures in Indie Publishing where I share my disasters – erm, experiences with Independent Publishing. In the last blog, we started discussing the first two things you need for a cover: an idea and an image or images. If you missed that you might want to check it out. Good? Okay, I’m assuming you now have those, so let’s move on to actually getting the cover finished! Back covers!?!? Now, calm down, we’ll get there in a minute. Okay, so you’ve figured out how to credit your people but who do you credit? AKA, who is putting this cover together? I suggest you start by hitting up friends and family, then branch out to internet friends. You probably know at least one person who can use an art program – and who will do it for next to nothing, which is our goal here. However, the Smashwords guy (I like calling him that) has a list of people who will do cover work for you, starting at $30 and up. I’m sure there are other resources, but truthfully, I don’t know them. If anyone else does, feel free to share! I’m a big do it yourself-er, so the bulk of this blog is going to tell you how to do just that! Whether you’re going through LuLu, Create Space or another POD, they probably have a handy dandy cover creator. If your POD of choice lacks this, then a good trick is to use LuLu’s cover creator, then download the finished PDF file and upload it to your place of choice. Cheating? No. You still made it. Be careful, though, and make sure that the cover size (aka print size) is the same though! A 5 x 8 cover won’t fit a 6 x 9 book! How do you use this magical and mystifying cover creator? It’s fairly easy. LuLu has a very, very detailed explanation: http://www.lulu.com/en/help/covers_faq. Create Space, however, doesn’t seem to have this (Their Help files are generally not helpful as they rely on forum posts rather than a real FAQ file). But, the tools are essentially the same. You can also create your front and back covers as whole images and upload them into the cover creators (I did this on LuLu for the test version of Shades of Gray) so that you can get exactly what you want. It’s pretty easy to put a cover together on your own. You have the idea and the images, now all you need is the type – wait. What font are you using? Is it a font you have the right license for? Just because a font is on your computer doesn’t mean the license extends to commercial projects (which a book cover is). It’s up to you, of course. The probability that the fonts owner will find out and sue you is small, but then the probability that Warner Music will sure you for downloading a song is also slim, and how many times has that happened? A Tagline is that little sentence on the cover of a book that grabs your attention. Things like “Soon to be a major Motion picture” or “Five Stars – the New York Times” are taglines you’re probably not going to deal with. However, if you have a review already, or even just a cool comment from a friend or relative like “Gripping, suspenseful tale”, then you can use this for your tagline. The key to this is that you want something catchy, and you want it to sound professional. You want to use their full name, not their nickname, screen name or “uncle Bob”. If you don’t have one of these then don’t worry, you can use something else that adds to the title of the book. For instance my title is Shades of Gray and my tagline says “Not everything is black and white…” (Yes, I realize now that “nothing is black and white” would be better, but such is life) which I carry over to the back with “Not everything is black and white, not even vampires…” This sentence sums up the over all “theme” of the book, plays off of the title, and is fairly catchy. I think that makes for a spiffy tagline. Of course I made it up, so that might have something to do with it’s spiffyness. If you don’t have a tagline then don’t worry. You don’t need one. However, taglines are very handy things to have because you can use them in so many other places besides just the cover. There are a lot of “free” font sites out there, but my favorite is Dafont.com. They have a great variety, it’s neatly organized into categories, the fonts are labeled with their individual licenses in the preview pane and, even cooler, you can choose the text you want displayed in the previews. 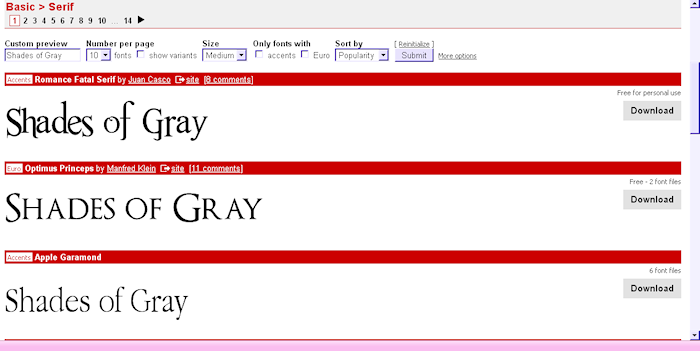 When I was looking for a font for my cover, I knew I wanted a serif font. Wait, Serif font? That’s a font like times new roman that has the little bits on the ends of the letters. This blog explains it with a great illustration: http://www.thepixelboutique.com/2009/03/the-truth-about-type/ . So, anyway, I wanted a serif font that was close to times new roman and was in all capital letters. So, I hopped onto Dafont and…. Now you’ll see there are different kinds of Licenses on the fonts: Free for Personal Use (this means you can do what you want with it so long as it’s for yourself, like personal webpages, gift labels, etc), Free (this should mean free for all, but you should always check the website of the font creator, or the read me file included in the zip file you download to make sure they mean free for commercial use), Shareware (which allows you to use the font for free as an evaluation, but you need to eventually pay for it) and Public Domain (which literally means not copyrighted). Remember, even if it says Free you should still check the website or read me file. I’ve found fonts before that were labeled free, but then their technical information said that in order to use for anything that you received payment for you had to notify them and send them a free copy. The font I used – Optimus Princepts – has the stipulation that if I make any real money off of it I should donate some to a charity. However, I haven’t made any yet, so…. So, even looking at only the free fonts, how do we know what font is THE font? A lot of it comes down to the gut feeling. “Does it look right?” If it doesn’t then that’s not the font you want. But, I’m going to try to give you some design pointers. 1. You will probably want to use two fonts on your cover – one for your title and the other for the author name or tag line. You could even use three spate fonts, but any more than that will make your cover look too chaotic. 2. That really cool, twibbly font may look awesome, but can you READ it? You want people to be able to read the title and author name easily. If they have to squint to figure it out, you’ve failed. Covers should impart information quickly, so a simple font is best, even for a “fancy” cover. There are plenty of clear, easy to read fonts that have some extra loops or swirls. 3. If you must use that super swirly, twirly font then try using it for the capital letters of the books title only, ala illuminated manuscripts of the medieval period. This will give people half a chance at reading the rest of it. 4. Don’t mix too many different kinds of fonts. For instance brush script would look horrible with a futuristic, bubble font. Use only one dressy font and then use very plain fonts for your other(s). You only want one to really grab their attention; if they’re all trying to stand out at the same time then it will just be a confusing mess. Before you can actually make your cover the best thing to do is get your cover template. If you publish through create space you can get the template really easy by uploading your interior file. Once you do a link will appear that says “download cover template”. The resulting template will be perfectly sized. These are one piece cover templates – think of it as if you pulled all the pages out of a book and then laid the cover flat out. Even if you are doing an ebook it will make your life easier to download one of these. The best way to use these templates is in a program that allows for layers, such as Paint Shop Pro, GIMP or Photo Shop. You could do it in Paint Brush without layers, but it would make it infinitely more difficult. Remember, if you don’t have any of these programs, GIMP is a free download, and it’s a pretty powerful program, might I add, with a lot of online tutorials to get you going. You may notice that Create Space says that you must use a program that saves the image as a PDF, but this is not so. Yes, you will need a PDF in the end, but there are ways to convert it, which we will cover later. I could do a long blog or two with details on how to actually use the art programs, but for the sake of this blog I’m going to assume you know what you’re doing. For a simple cover the only things you need to be familiar with are the “alphabet/text” tools, copy and paste, layers, flood fill and the selection tool. You should remember not to use too many colors though and that the colors you choose compliment one another. Also, be sure your title stands out. If your cover background is dark then you don’t want your title to be a dark color too; you’ll want it to be a light color. And, the number one color rule: mix your own colors. The premade colors tend to look cheap and, well, novice. Just grab a slider bar and move it a notch in one direction or the other to give the color some more depth. So, now the front of your cover is done, but the back is just an empty rectangle! What gives? Well, I’m going to cover the back cover in the next blog because if you’re doing an e-book you don’t need to worry about a back cover at all. In fact, if you’re doing an ebook you can just use your cool crop tool and crop the cover down to just the front side and you’re done with the cover completely. Yay for you! Bleed: The Bleed is the area between the “safe zone” and the trim line. Anything that you want to completely fill the space, eg go clear to the very edge of the cover, should extend INTO the bleed for safety sake. This includes background/fill colors. One Piece Cover: This is a cover that wraps around the whole book. Imagine taking all the pages out of a book and laying the cover face down and open. That’s a one piece cover. Safe Zone: the area of the cover where your content is “safe” aka it won’t get trimmed off when they cut it down for the book. Tagline: The snappy line on the front or back of your book that catches people’s attention. Trim Size: This is the size the book is “trimmed” to, aka, the size of the final product. Anything drawn outside of the trim lines will be cut off without question. Get the Indy Book That Inspired the blog series!